Sure, but its not the same horse....its been replaced many times. And we no longer use them for general or mass transport. Nope. Horses are the existing technology. They are big and dirty, and their waste (and carcasses) caused a lot of disease. But they used to be super cheap, before people started living in cities in a big way - you just put two of them together and 12 months later you'd get a new horse. For free. And they ran on grass. Then they came out with cars. "What idiot is going to drive one of those?" people asked. "They don't even last as long as a good horse! And you need fuel for them. There aren't enough peanut trees in the entire WORLD to produce enough fuel for everyone to have a car! And there are almost no roads. You'd need to spend billions of dollars to build roads - and who is going to pay for THAT? Let me guess - you want to tax everyone to build your precious roads for the elite, out of touch 'motorists'." "Besides, I read this article that said that they're never going to go faster than a horse, anyway. People will be killed; they will suffocate and women's uteruses will fly out of their bodies*." "And you'd need spare parts and rubber and oil and paint and NONE of those industries could EVER make enough of that stuff to replace all the horses in the country. And what percentage of people in the US have cars, anyway? 1%? Don't make me laugh. How are you going to get that many cars? Breed them? Clueless car supporters don't even know car's can't breed." It's not surprising at all. Nor will it be surprising when renewables make a similar replacement. They will have their problems (as cars do) but the upsides will far outweigh the downsides, and that will drive replacement. Texas Got 18 Percent of Its Energy from Wind and Solar Last Year. "The Texas grid, operated by the Electric Reliability Council of Texas (ERCOT), has seen sustained levels of wind energy penetration above 40 percent for hours at a time without significant issues." All this while holding retail electricity prices cheaper at lowest levels in the past decade. Two coal plants in my area are being closed next year. Yep. And Iowa has lower-than-average electrical prices; they get 36% of their energy from wind. For anyone who wants to gain a basic understanding of Nuclear power and in particular Thorium salt reators,..
A couple of hours relaxing with this will expand your mind..
Last edited by Hillhater on Feb 13 2018 10:19pm, edited 1 time in total. One of the (many) latest inititives in the strange world of S Australias commitment to Renewable Energy ...(lets be honest ..non-coal) ...is this "Barker Inlet". 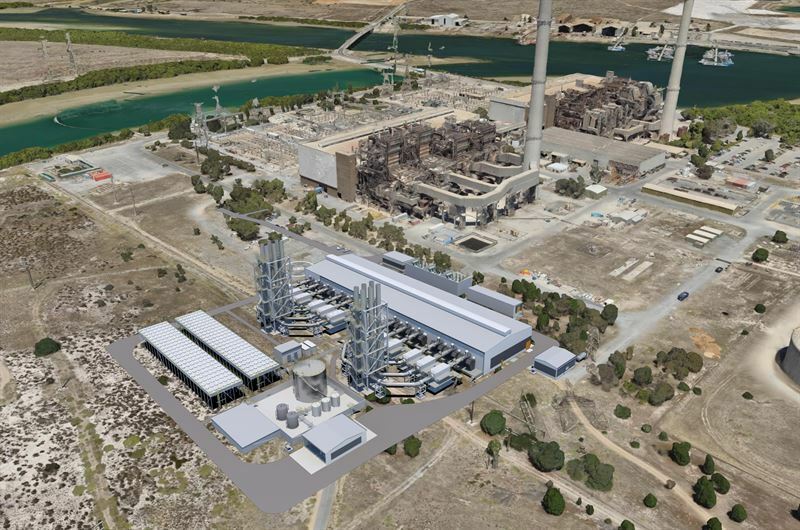 (Torrens Island) proposed power plant. See the (artists impression of) shiny new generator plant in the bottom left of this photo..
Well, that is a new 211 MW Diesel/gas powered generator plant using 12 of these monster ICE engines..
Its intended to replace the 50 yr old thermal gas power plant in the background...which is still operating fine with many more years service life. Now that is fine, SA desperately needs more generation capacity, but there are a few issues i find hard to accept. 1). The Thermal plant is still fully operational and has at least 10-20 years service life expectation remaining. 2). The reason this type of ICE driven generator plant is being used is due to the need for fast output response to deal with the severe fluctuations from the Wind farms in SA. 3). 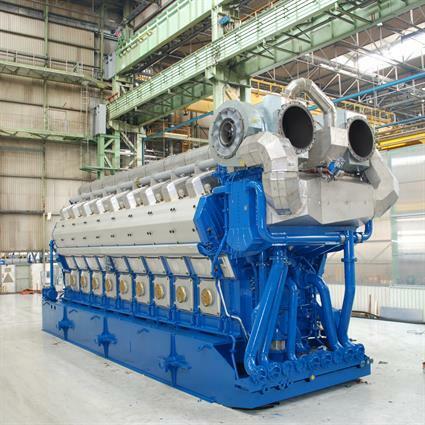 The entire 211MW capacity of this $295m plant is only equal to ONE of the 8 thermal 200MW generators in the old plant ! 4). Since Wind generation is given priority in the wholesale market, its a fair assumption this new plant will be on standby much of the time, lowering its CF dramatically, effectively destroying any efficiency expectations, and increasing operating costs.....and consequently power costs. They should have used BESS. Much cheaper and faster responding. even that limited capacity diesel plant can provide 5+ GWh per day if needed..
How expensive would a similar capacity BESS be ? ..and what would you use to charge it ? But it would not be needed at all if the output from the wind farms was more consistent. In reality, this is all part of the unseen cost of adopting a RE generation plan. Yeah, its owned by AGL who seem to be pretty dubious in their operations as they seem to love deliberately creating scarce energy supply. But their actions as a private company make sense, if everyone's food and sodadrink consumption were somehow deemed to be increasing sea water levels then, of course, the government would be engineering some kind of weird marketplace to force people to drink more water but if the water comes in a kind of random fashion and the public NEED to buy it then, of course, its going to help increase profits if you can limit supply. One thing I wondered about is the average power coming from Germany's wind vs its claimed capacity. Currently, Germany has 49.6GW (49,600MW) of wind capacity and generated 103.65TWh of wind via electricity (who knows how much actually went used). There are 1,000,000MWh in 1TWh. 103.65TWh = (103,650,000MWh / 8765.5hours_in_a_year_average) = 11,824MW average power generation. So German's 49GW wind power-station is really a 11GW power-station. Like I said before, if you bought a car and it could only drive on average %23 of the claimed speed you wouldn't buy it. To me that widget seems to be heavily manipulated to make green energy look better then it really it is, to me it seems to use some upper highest average of the renewable energy being generated because its Always sitting well above what the offical AEMO dashboard claims or what electricitymap.org claims. All screenshots taking within a few mins of each other, Electrictymap seems to run 1+ hour time for whatever reason. Last edited by TheBeastie on Feb 14 2018 9:15am, edited 4 times in total. If Jay Wetherall said one day, the SA government wanted to build a 2 GW thorium reactor in Port Pirie (and it would apparently have immediate support from the federal Libs, because they're keen on nuclear too) is there a reactor he could sign on the doted line for? Somehow I don't think it's mature enough to have been turned into a viable reactor. Otherwise, every reactor being built today would be a thorium reactor based on the promised advantages. Thorium reactors do have the major disadvantage (in terms of government support) that they don't produce any nuclear weapons materials as byproducts. They actually burn it up instead. Where's the fun in that, you know, if you're a demonic overlord? I suspect there are too many powerful , influential , parties with big interests in existing energy business's...Oil, gas, Coal, Uranium, etc, ...that would not want to see Thorium suceed. ....And it sounds like China are well on their way with thousands of Scientists working on it already. Like the man said, we will probably end up buying these reactors from China, because of our internal hangups ! You are aware that the average speed driven of almost every vehicle on the planet is a lot less than it's top speed? Or do you only drive your car flat out on an empty oval circuit? And that's forgetting the time spent refuelling or servicing or sleeping. Maybe you want to stop flogging this metaphor? Why on earth would you criticise the capacity factor of a peaker plant? "This piece of equipment that is designed to run briefly every now and again doesn't run 100% of the time!" It looks like Thorcon will be the first to fission with molten salt Thorium if the regulatory process is fast laned in Indonesia or Vietnam. If world regulators don't hang it up over the fact that you can't put a serial number on a piece of liquid. It will roll out very quickly once certified based on the shipyard factory construction method and final assembly transport by barge. Indonesia will be a rich manufacturing area if it can install 20 GW of GenIV nuclear in the next 20 years. Thorium reactors do have the major disadvantage (in terms of government support) that they don't produce any nuclear weapons materials as byproducts. Neither do light water reactors. In fact, they take enriched uranium and turn it into contaminated less-enriched uranium. Now, breeders are a different story. I suspect there are too many powerful , influential , parties with big interests in existing energy business's...Oil, gas, Coal, Uranium, etc, ...that would not want to see Thorium succeed. Of course. And that's true of every new energy product that's come out in the past 200 years. And if you expand it to "powerful , influential , parties with big interests in existing business's that would not want to see new technologies succeed" then that's true of basically every new product that uses new technology, ever - from digital cellphones to computers to cars to electric vehicles to airplanes. Fortunately they rarely succeed in quashing such new products. I doubt it. The big barriers will be safety and cost, not "internal hangups" - and those barriers will prevent purchase and operation, not development. Go to a city sometime and see what speed people drive their cars. even that limited capacity diesel plant can provide 5+ GWh per day if needed. If they needed that sort of energy they should have installed a fast startup combined cycle gas plant. Very expensive - because that's not what you use BESS for. If your requirements included "zero emissions" then how much would it cost you to run that recip plant for a day? Solar, wind, spare conventional generation, the usual. Or if they got themselves a BESS. No, I won't - because I work. However, I don't really need to - I am fully aware of the promise of thorium fuel cycles. \Serious question: How many of these next-gen thorium/molten salt reactors have been built as at least a working prototype yet? Just the one at Oak Ridge back in the 1960s. Supposedly it ran for several years with no problems. Problem nowadays is that licensing is a lot more difficult. I used to do consulting work for the Nuclear Regulatory Commission up until 2011. They are the biggest bunch of know-nothing bureaucrats who take forever to make a decision about anything. All they know how to license is solid uranium-fueled pressurized reactors. On the bright side, China supposedly has several hundred engineers working on it. They will probably be mass producing them within a decade if the technology is really viable. Those contaminants you mention include plutonium. Reactor waste is a source of this element. Thorium reactors don't provide it in useful quantities, so they haven't been promoted or developed by those who demand a supply of plutonium. Thanks Bill, let's see what appears in a decade or so! Right. However, thorium reactors do produce U-232 which is also quite usable in nuclear bombs. Of course it's very hard to separate and work with - but that's also true of the Pu-239 that you can get from spent LWR fuel. Those who demand a supply of plutonium have traditionally used breeder reactors, which produces Pu-239 in much more useful quantities. 1)... Its NOT a peaker plant. 2)... It will NOT replace the older GAS fired thermal plants, because the state is constantly having to import 500-600 MW of power from neibouring states, so they cannot cut any other generating capacity . 3)... This plant is designed to operate as a fast starting back up plant for when the wind farms fall short on wind, (which happens almost daily in SA ). and means the plant will be running for periods of 12-48 hours continuously at times.